This is the first time I have ever tried to grow tomato seedlings from seed. Normally, I have just gone down to a place like Lowes or Home Depot and bought what they had. This year, I wanted to expand my knowledge and skills by doing this. I hope I'm successful, but I know I can purchased the seedlings if all goes bad. Today, I received my order from Burpee in the mail. 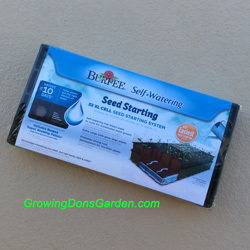 I bought one of the 32 xl Cell Seed Starting Systems from them. I see that on Amazon, there is a 72 cell system which is larger than the one I purchased, but for the same amount of money. The reason I bought this is that since I've never grown a tomato seedling from seed, I wanted every possible chance of success. While I love to learn, I hate to reinvent the wheel. I'll learn from what others have done. Plus, it is a small enough thing that I can put up on my home office desk near the window and monitor. I did get a package of tomato seeds from Burpee as well. 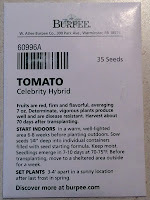 The ones I have been using in my Earthbox that I love and they work well is the "Celebrity Hybrid" Tomato. Maturity is at about 70 days and the size of the tomato is around 7 ounces. Because I live in Florida, the heat usually comes on hard in mid to late May and so anything that hasn't come close to being ready is usually stunted and slowed by the sun and heat. Plus, the longer into the months it goes, the hornworms mysteriously show up. So anyway, that's the beginning. I'm really just having fun with this. Growing things in a garden is something I enjoy. It seems like the tomato plants I grow in my Earthbox out surpass anything I can ever find in a store. There is nothing like a homegrown tomato! Anyway, make sure you bookmark this blog and keep checking back. I'll share what happens, even if it doesn't work out well. If you have any tips for me, please leave them in a comment. I'd also love to hear about your own tomato growing experiences. Just make sure the comments are respectful and not derogatory towards any company or individual.